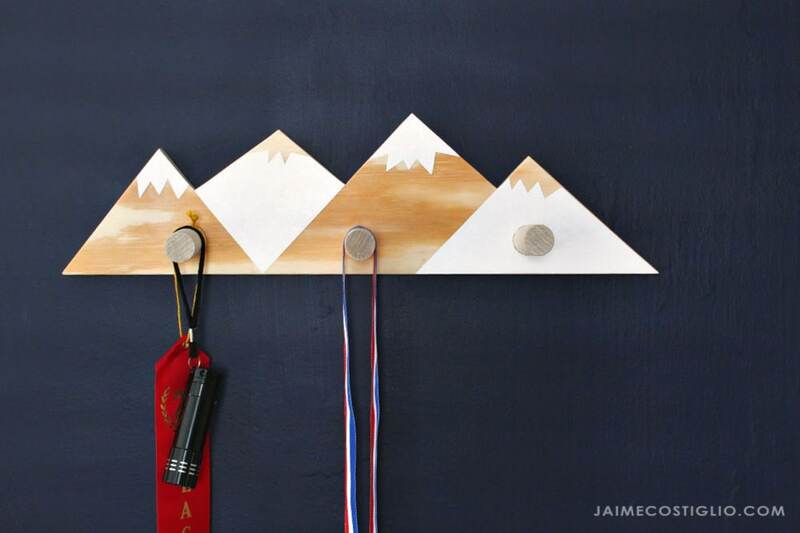 Help kids stay organized with this set of mountain shape wall hooks you can make yourself! This may be the closest to skiing my son ever gets with a great view of the mountains. 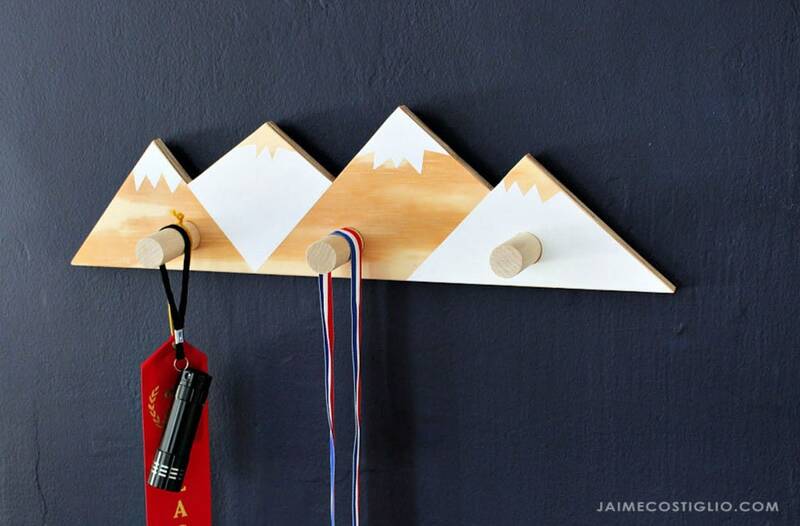 A DIY tutorial to make mountain shape wall hooks using plywood. 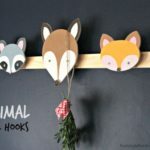 Easy to cut out and add the dowel hooks using free plans. 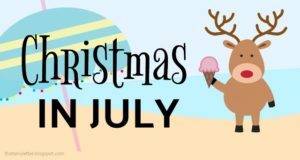 Ana and I are back with another holiday gift build today. 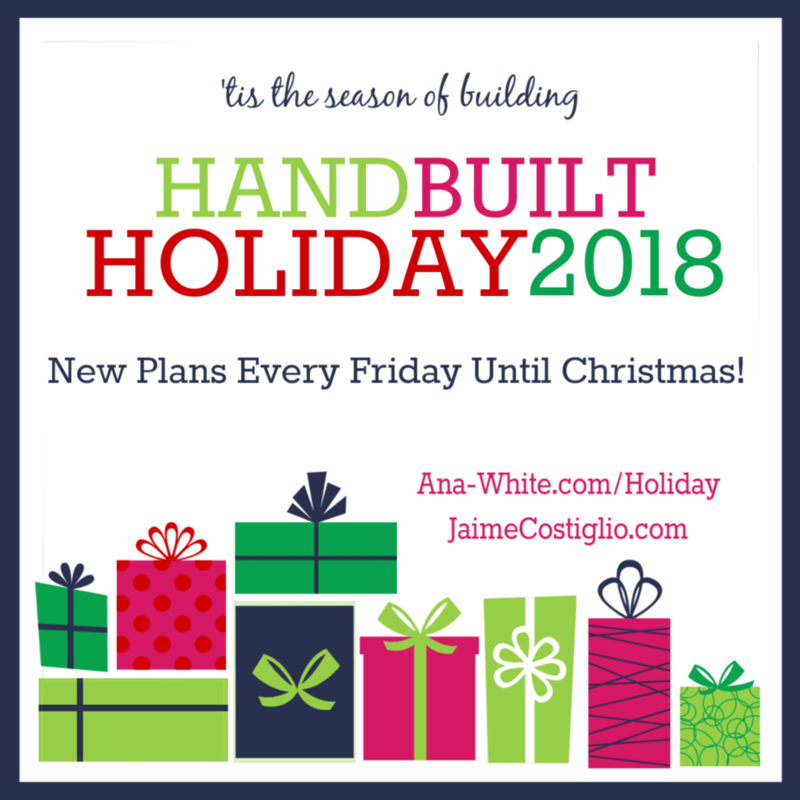 Every Friday before Christmas we share a new gift project as part of the Handbuilt Holiday series. 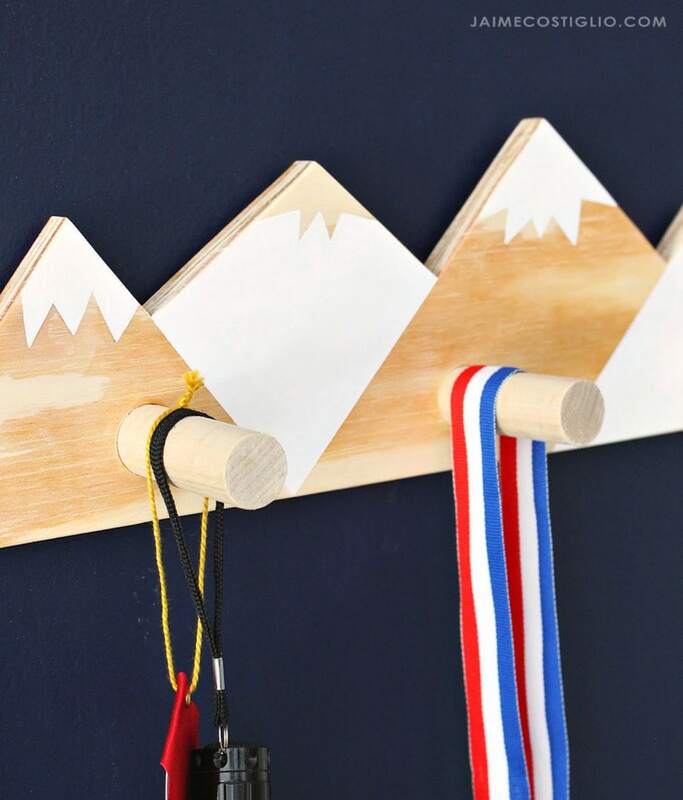 Today we’re making it easy with a simple yet useful set of wall hooks complete with a mountain view. 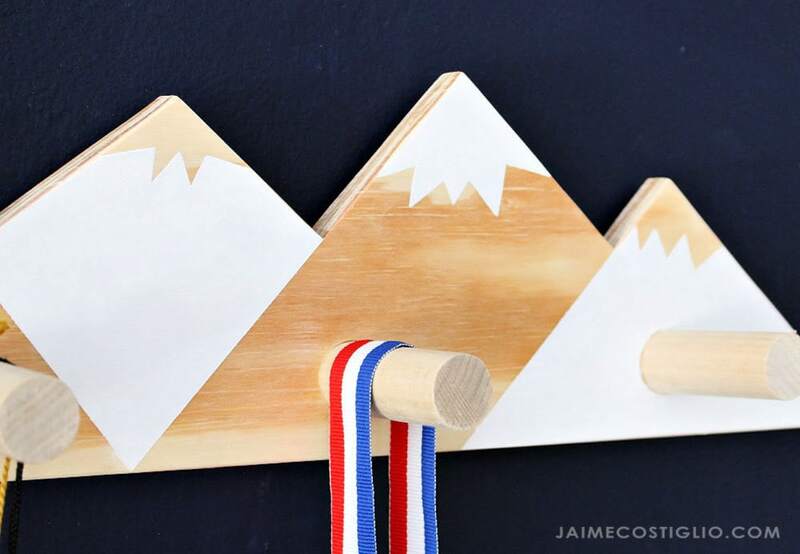 These wood hooks depict a mountain range using white paint with sharp edges. 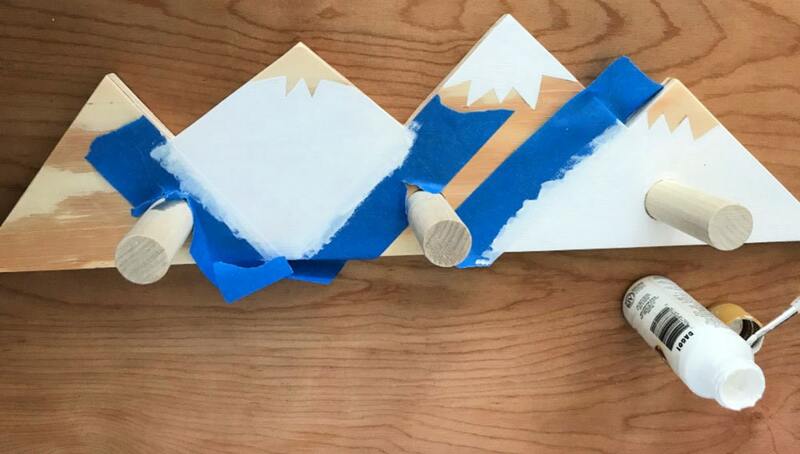 I’ll share how to achieve the mountain tops using painters tape down below. 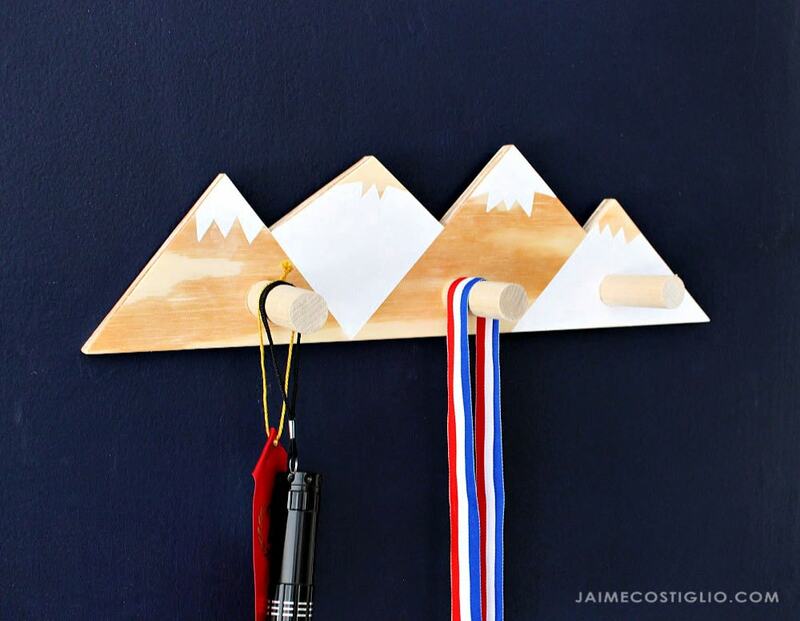 The hook itself is a 1″ wood dowel and it’s partially inset into the plywood mountain background. 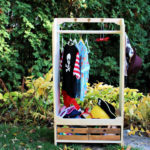 The wood dowel makes for a solid and secure spot to hang all the bits and bobs kids tend to collect. This would also be great in a bathroom space for hanging hand towels or entry area with smaller hooks for keys. 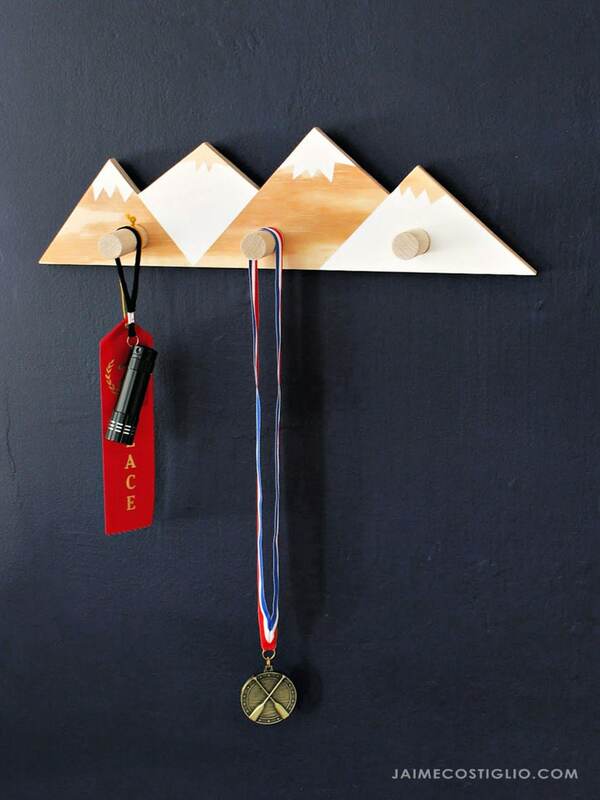 Ana and I borrowed inspiration from Crate & Barrel’s mountain range wall hooks (no longer available). Follow Ana’s plans here and print out the dimensions sketch before beginning. 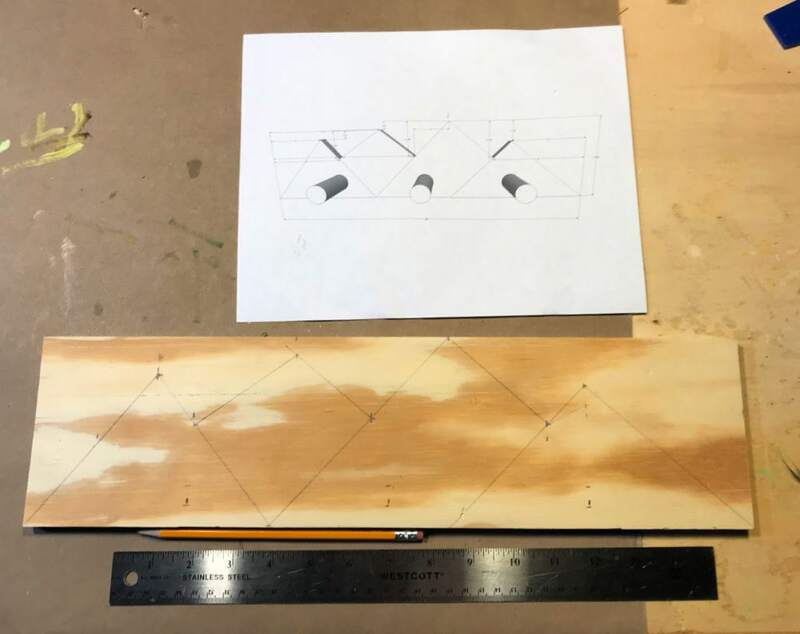 Step 1: Print out the plans and transfer the sketch to the 1/2″ plywood. 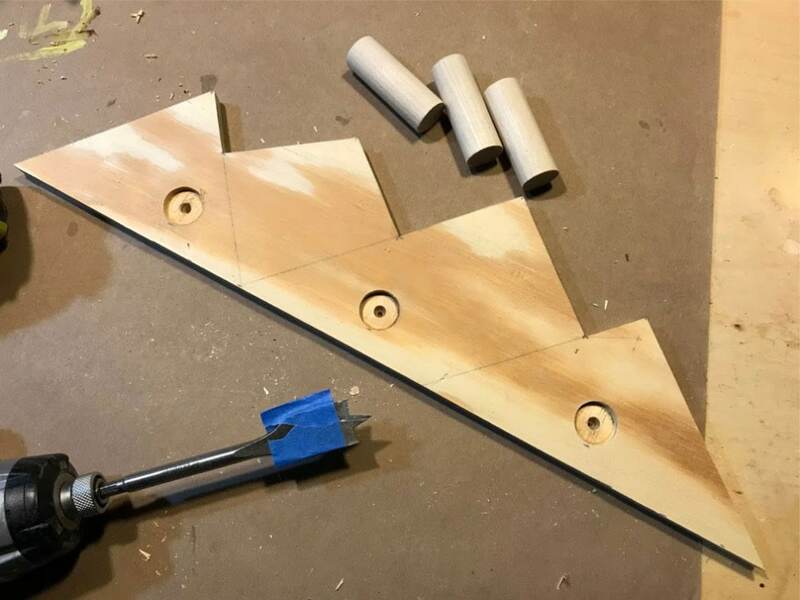 Step 2: Cut out the mountain range using a jig saw or scroll saw. 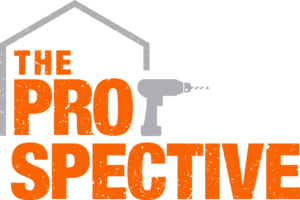 Step 3: Determine hook placement predrill about 1/4″ deep hole for the dowel. 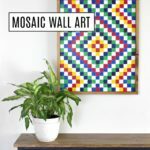 Use a 1″ space bit and mark the depth with painters tape. Step 4: Attach wood dowel hooks using wood glue and 2″ countersunk wood screw. Apply painters tape and paint mountains. 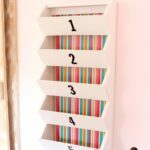 A fun way to clean up your room! I can see a whole wall full of these hooks, that would be so amazing. I’ll see you back here next week for another Handbuilt Holiday project. 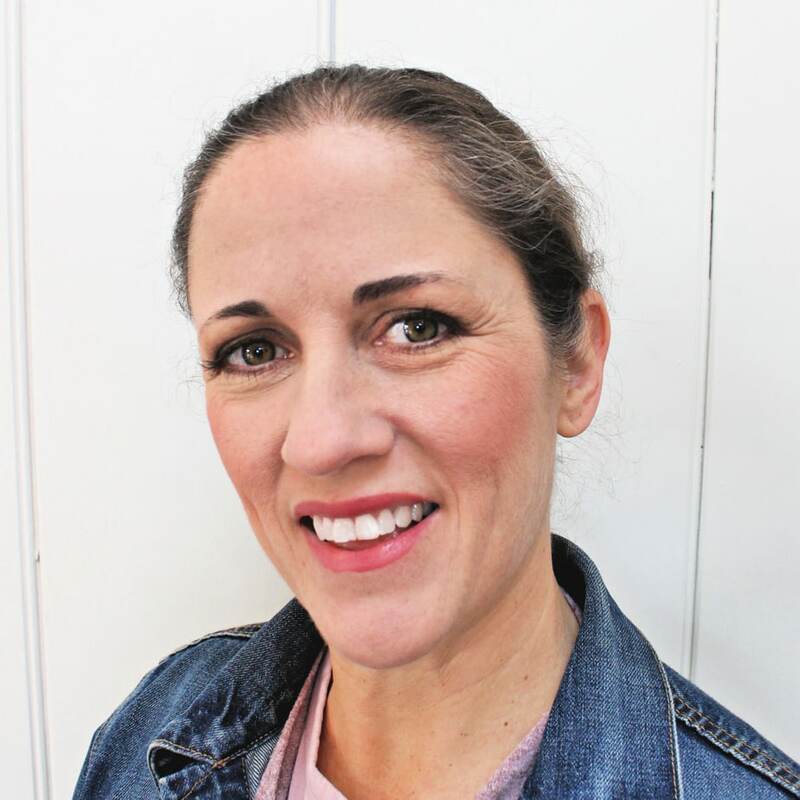 Did you just create the sharp angles on the peaks with painters tape? Yes, see the photo above in step 4. I drew the peaks with a pencil and straight edge and then handpainted the zig zag looking peaks. How did you secure it to the wall?? Hi Hayley, To attach the wall hooks I used two sawtooth hangers on the back and nails in the wall.